Summer Fun is a fantastic way for your kids to spend the summer! We offer a variety of classes like adventure, arts, crafts, computer, cooking, foreign language, math, music, drama, reading, writing, science, sports, dance, and much more! 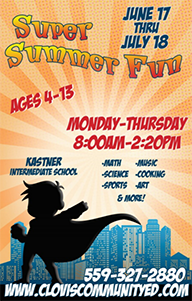 It's going to be a Super Summer Fun 2019! Catalogs will be delivered to all CUSD elementary schools, you will be able to view classes online, and REGISTRATION BEGINS on May 1st. We have over a hundred classes to chose from! A student can take one class or up to six classes. One class for example, is Mondays and Wednesdays from 8:00 - 10:00am for the entire 5 weeks. The cost of one class is on average is $119. For more information please call 559-327-2880.